With Easygenerator you can report learners’ results either directly to Easygenerator or to the custom LRS. NOTE: Results tracking is not available if the Reader course template is used. This template is not designed to check the learners’ knowledge. On the Configure step of the course editor you can adjust results tracking settings. Here you can enable/disable results tracking. It does not have any influence on results tracking if you run your course from LMS. Disable the option Allow user to skip tracking and tracing to make results tracking a required step, or enable this option to allow users to skip results tracking. When results tracking is enabled and a learner starts the course they will be asked to enter their name and e-mail. Then a learner should click Start and report my results to start the course. If learners are allowed to skip tracking and tracing, they can click Do not report, just start to start the course anonymously. 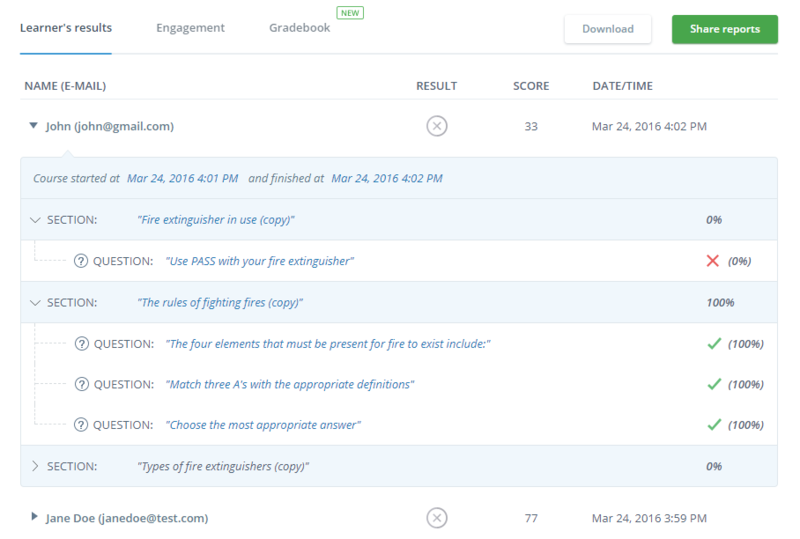 Allow scoring of content pages if you want your learners get points for visiting content pages. If it’s disabled, only questions have impact on the course progress. Mastery score means that to pass a course successfully, learners have to get this score per each section. This score can be seen on the progress bar under each section icon. Learn more about mastery score. Under the Advanced settings choose if you want to report the learners’ results directly to Easygenerator (chosen by default) or to custom LRS. If learners’ results are sent to Easygenerator, you can see them directly in the Easygenerator on the Results step of the course editor. There you can find the total score of the course per user and results per learning objective and question. NOTE: Easygenerator users that have a free account can see only last ten learners’ results. Those users that have a paid account can see all learners’ results and can also download results as CSV file and share results. Learn more about Engagement here. Here is a short video on results tracking in Easygenerator. 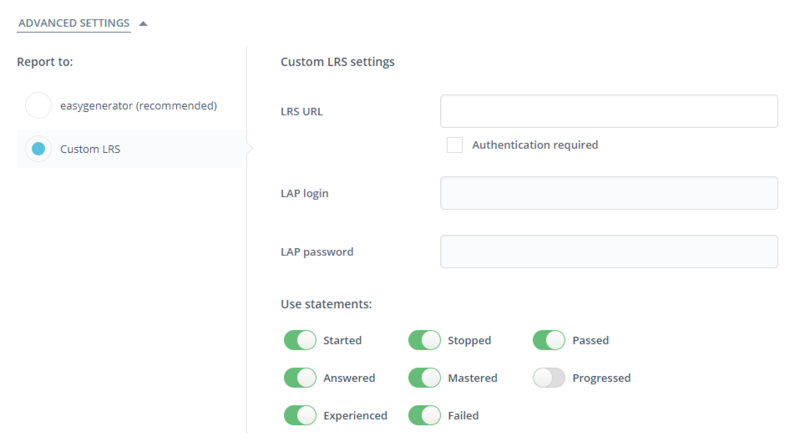 To report learners’ results to custom LRS, first you need to set up your own LRS. For example, see http://scorm.com/ and http://www.saltbox.com/. 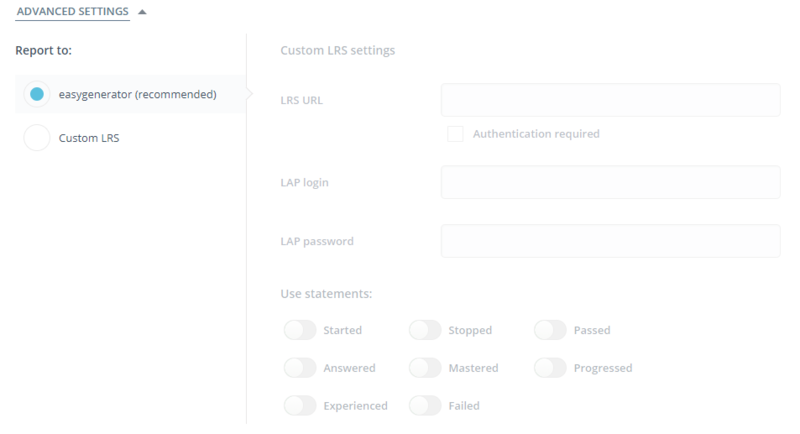 In Easygenerator, in the Custom LRS settings you should specify LRS URL. Authentication is used to specify login and password of the Learning Activity Provider (LAP). Learning Activity Provider is actually the course that reports statements. In some cases LRS requires LAP to be authenticated in order to post statements. Therefore, if such requirement exists in your LRS, specify the correct LAP login and password. When a course is published with Results tracking enabled and the option to report to custom LRS is chosen, a learner will be asked for credentials to report the course progress to LRS. Started: when a learner opens the course and enters their credentials. Answered: when a learner answers a question. Experienced: when a learner visits a content page. Progressed: when a question is answered to indicate the current overall score. Stopped: when a learner clicks Finish. Mastered: a score per learning objective. Passed: when the course is completed with an overall progress 100%. Failed: when the course is completed with an overall progress less than 100%. 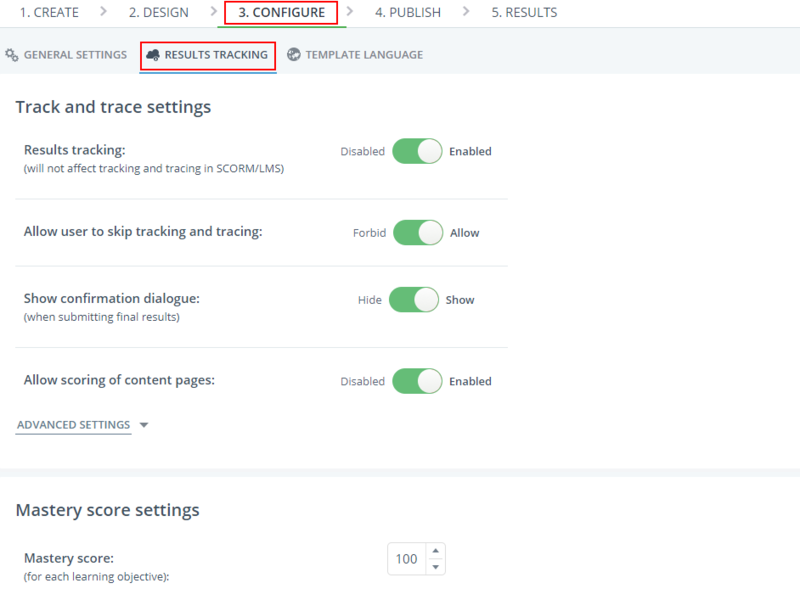 NOTE: If you enable results tracking or change the track and trace settings for the already published course you should go to the Publish step and update the course to apply the latest changes. Here is a short video on results tracking in your LRS.